Pharmacy Complete is run by pharmacists who love pharmacy and we have dedicated our lives to developing and promoting our profession. We are passionate about what pharmacists and their teams do for the health and wellbeing of people, putting the safe use of medicines and healthy lifestyles at the centre of everything they do. We enable this through evidence based, high quality support and training. The landscape for pharmacy and the industry is changing rapidly, we must adapt. Applying years of local, national and international experience within industry, community, primary care, hospital and public health we understand the day-to-day challenges facing pharmacy. 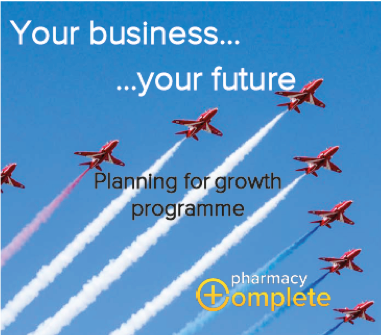 Our innovative programmes are based on that knowledge and experience, are practical, will make a difference and achieve tangible, positive outcomes across all sectors of pharmacy and industry. Together we can engage, inspire and enable pharmacists and their teams to reach their potential to improve the public’s health and create a healthier future for pharmacy. We focus our energies on enabling pharmacy for a healthier future through training teams and consulting with leaders. Developing people to be great is a passion of ours. We know that having a highly developed, engaged and motivated workforce improves performance. It also makes for an exciting and stimulating place of work, where people want to give their best. We care about you and your business as if it were our own. Our clients tell us that they value our ability to listen, connect and extensive experience to truly get to what they need. Our attention to detail and quality means that we will deliver the results and outcomes you want. Developing people to be great is a passion of ours. Do you want to improve the motivation, performance and retention of your team? Training and developing people is far more than improving knowledge and skills. Developing the will to change requires training that is enabling, inspiring and excites the individual to make a difference. We take pride in making sure our training programmes engage both hearts and minds. We know that having a highly developed, engaged and motivated workforce improves performance. It also makes for an exciting and stimulating place of work, where your team want to give their best every day at work. Alongside our distance learning courses we offer a range of face to face training events tailored to suit your needs as an organisation and train larger groups at one time. “I can highly recommend Pharmacy Complete for their professional and personal approach. Pharmacy Complete is run by pharmacists who love pharmacy and we have dedicated our lives to developing and promoting our profession. We pride ourselves on delivering training and consultancy support to the very highest quality, ensuring that what we do makes a real difference. We are pharmacists and pharmacy professionals with extensive knowledge and experience across all aspects of pharmacy practice. We have operated in senior leadership roles within the profession, with a proven track record of delivery. We will do all we can to understand your needs to deliver solutions that will work. We offer the personal touch. A director will be in touch with you regarding your enquiry within 24 hours, frequently by return. We have a network of specialists across a range of areas on hand to deliver the right intervention and work with trusted partners who share our values and our approach to client care. Your success is our success. Your business is our business. We will go the extra mile for you to ensure that we always deliver excellence. We value highly the relationships with have with our customers and we work hard on them; we want to make doing business with us a great experience and something we all enjoy. Get in touch and we can begin working towards a healthier future together.